The white “Blushing Bride” hydrangea shrub is showing off some mighty nice, big, white flowers and I decided that I would try photographing them with starfish for my wedding shops. This is the photo I chose to use – with the background removed, to make the first set of custom stationery for Sandpiper Wedding. I call it Seaside Garden for brides who are married near the ocean in summer (or Fall) when the hydrangeas are blooming. I think it’s a nice combination. It could apply to any couple who loves the beach too. I always say, “it’s your wedding, do it as you want”. Personally, I hate to see everyone choose the same old designs over and over just because they are popular. Choose something that is uniquely you. This stationery will be very unique since I took the photo, created the design and made the cards. 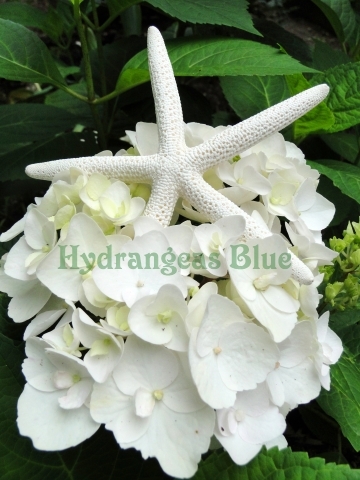 It was a toss-up between that beach-themed store and the hydrangea themed store, but I decided to use the white flower alone for the BlueHyd shop. At some point I will use the flower alone to create wedding invitations, but for now I am working on the “Seaside Garden” design, with a blue version to come.